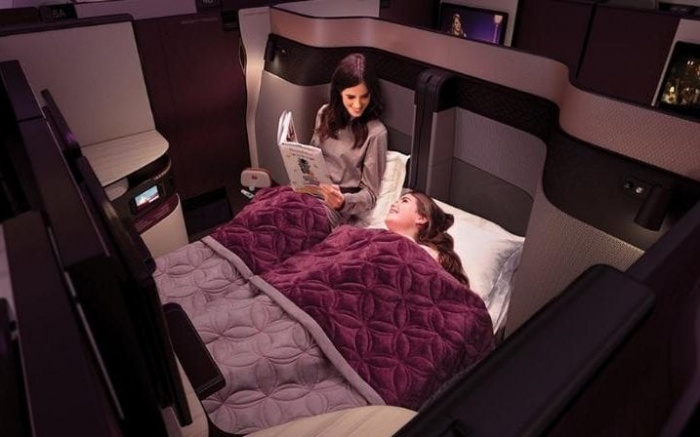 Qatar Airways has hosted a stand-side reveal to unveil its new Business Class experience to the world’s media and travel trade leaders at ITB Berlin. Ushering in a never-before-seen standard in Business Class travel, the customisable private suites, named QSuite, introduce a host of firsts to Premium Class travel, reshaping expectations for global business travellers. The new seat design was first unveiled by Qatar Airways chief executive Akbar Al Baker at ITB Berlin exhibition on the Qatar Airways stand. Launched at ITB Berlin, the world’s largest travel trade show, the unique and patented seat has been two years in the making. Its highly anticipated unveiling drew media from around the world and up until the reveal had kept industry experts guessing as to what features and developments it would include. Al Baker said: “Today I am proud to unveil the future of Premium travel with our new QSuite Business Class. “Our unique and patented design is a world first in many ways and challenges industry norms by offering passengers more privacy, more choice and more personalisation. “With these innovations, Qatar Airways has revolutionised the way we serve our Business Class travellers enabling our passengers to enjoy a First Class experience in Business Class. To further complement the customisable on-board seating experience that passengers will now enjoy, Qatar Airways is also launching a new food and beverage concept, introducing a menu that offers a host of new dining choices. In addition to the existing decadent ‘dine on demand’ service, the new Business Class menu will now offer a selection of snack ‘sharing dishes’ available throughout the flight, allowing travellers to turn dining at 35,000 feet into a social experience.